Opinion: what are the steps Ireland can take to improve its standing as the worst in Europe for climate change preventative measures? The UN Climate Conference (COP 24) in Katowice in Poland saw the publication of the Climate Change Performance Index for 56 countries. Ireland’s performance in terms of preventing precarious climate change was ranked the worst in the Europe. Although Ireland moved up one spot compared to last year’s index, it is still in the group of very low-performing countries. The Climate Performance Index is a combined assessment on four different components namely greenhouse gas (GHG) emissions, climate policy, renewable energy and energy use. These define how good a country is doing in terms of preventing climate change. Focusing specifically on energy, Ireland has been ranked one of the low-ranking performers (40th position) in the energy-use category and rated medium (28th position) in the renewable energy category. In comparison with the 2018 ranking, no major improvement was evident on any of the renewable energy or energy use indicators. In fact, compared to last year, Ireland has slipped behind by 13 spots ranking 50th in terms of energy use per capita development in the past five years. It appears that Ireland is still lacking in terms of energy efficiency policies and their implementation which are needed to improve per capita energy use index to help meet our Paris agreement commitment. It was clear in 2016 that we were significantly behind expected targets. With the existing policies and our progress in last couple of years, we will be unable to meet the 2030 target or our committed share to help keep the global warming to well below 2oC. Although recognition has been shown for our increased renewable energy share over the past five years and our supports scheme for renewable heat and renewable electricity, we are significantly off track to meet the 2oC pathway. Analysing the renewable energy index, it is evident that with the existing policies and targets for 2030, Ireland will fall short considerably, potentially over 50 percent short of the 2030 target which is required to keep the global warming well below 2oC. On the other hand, we are not seeing a fast decoupling between energy demand and economic growth. The latest SEAI Energy In Ireland report saw a 0.5 percent increase in energy demand with an economic growth of three percent in Ireland in 2017. It will be interesting to watch this trend for next couple of years as the European Commission has forecasted strong growth in 2018 and 2019. In 2018, GDP growth of 5.6 percent is predicted in Ireland and the corollary is a significant increase in energy demand as well. There is a clear indication that we need to strengthen the implementation of our existing energy policies and programmes, while exploring the opportunities with new time bound policies, requiring immediate action, to meet our Paris commitment and help meet the 2oC greenhouse gas emissions target. We need to dramatically increase our efforts in our research and innovation sectors through new strategies and investments to speed up the development of low carbon technologies, new business models and policy options for all the priority sectors. The government need to allocate significantly more resources towards decarbonisation of electricity, industry, buildings, and mobility sector. These resources are required not only in terms of creating innovation, but also to make sure that these technologies, business models and policy innovations are implemented in a timely manner. In the electricity sector, we need new policies, regulations, increased investments to enable the growth of both distributed renewable energy generation and grid-scale renewable generation. We need to encourage consumers to produce and store their renewable electricity to manage their demand not only during peaks but, also during normal hours. On the other hand, transport demand increased by two percent in 2017, remaining the largest energy consuming sector with 43 percent of energy use in Ireland. There are significant good practices and approaches available internationally to improve our existing transport system which we need to consider. We need to raise awareness and promote uptake of low-carbon fuelled transport by investing in the infrastructure projects to increase the number of renewable fuels charging stations nationally. Public bodies need to demonstrate leadership through procurement, where the government might also consider mass public procurement to scale up the use of low-carbon transport such as providing information on and promoting Electric Vehicles in all the major cities. We also need to significantly invest and speed up the implementation of digital innovations such as artificial intelligence and blockchain, and related innovative business/market models in the energy sector which will further bolster the market penetration of low carbon technologies. It’s time to convert our actions into missions, otherwise we will have no credible excuses for future generations. 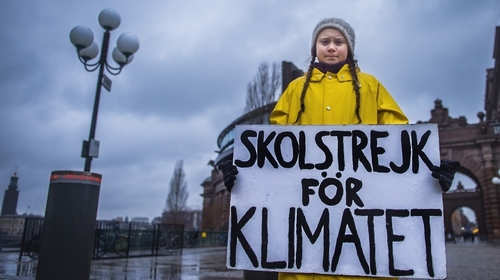 To quote the inspirational 16-year old Swedish climate activist Greta Thunberg at COP 24,"we cannot solve a crisis without treating it as a crisis".